Okay, Moms. I get it. The LAST thing you want to do is get yourself dressed (dressed? In actual clothes?! What are those??) and leave your house with your 7-week-old. But hear me out, because I’m going to tell you why you may be really glad you did. For the last 50,000 years of human existence, most new moms would have been surrounded by sisters, moms, aunts, and other relatives who would have aided them through the first few delicate months of motherhood. I imagine women back then… sitting in their huts, preparing food, and nursing their babies and toddlers. Complaining about their mates being out too late hunting tigers. You know, the usual. But women in our generation are often far-flung from the family and friends they hold near and dear. Many of us spend long days alone with our new babies. Watching the clock. Counting down the hours until your partner gets home (if you have one). If you’re a single mom, it can be even more lonely. I used to sit around wondering what I should be *doing* all day. While this may be “normal” in our twenty-first century society, it’s certainly not natural. We weren’t meant to raise babies on our own. 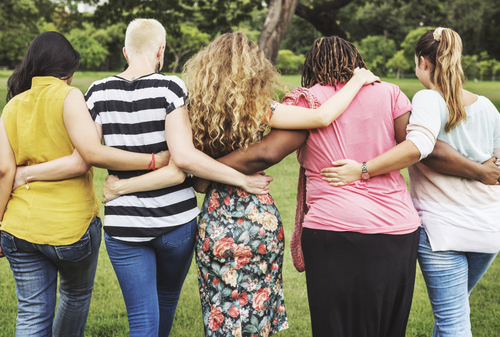 The postpartum period is a critical time to connect with other moms. And I don’t just mean on the internet (although it’s better than nothing, eh? ), but actually in person, in the flesh. The hardships, joys, and bewilderment of being a new mom foster bonding in a rare and unique way. These relationships can be enduring; the friendships many of our staff made when their first children were born remain strong today. This is especially true if you aren’t going back to work. When we lose our co-workers, the loss of our place in a group or community is even more pronounced. Your job right now, sister, is to build your own community. Or find one that already exists. Who better to learn from about motherhood, parenting, and all the different things that go along with having babies than other moms? If you needed support or had questions about a work project, you’d likely collaborate with a colleague, right? Same thing here. You have now taken on this new job of being a parent, and other moms (new and experienced ones alike) are your colleagues. Even if they don’t have the answers, you can bounce ideas off each other and learn from each other’s successes and mistakes. And believe me, it can be downright funny/entertaining at times. Who else is going to be straight with you about all the nitty-gritty details of new parenthood (and not be grossed out by the photos you snap of your baby’s diaper rash)? Seriously, though, other moms can help you figure out a great deal of the baby stuff you’re unsure about: how much spit up is too much; what you’re supposed to do about your baby’s gas keeping her up all night; how to increase your milk supply; why you shouldn’t freak out that your baby isn’t smiling yet (but your baby tracker app insists she should be by now); and when you’ll actually feel like having s-e-x again (never?? Just kidding…kind of). When it comes to navigating this whole “keeping a baby alive” thing, other moms get it and have your back. Not to mention, moms are super smart and inventive—have a problem you need a solution to? (How to keep your playroom organized? How to store diapers?) Ask a mom. Chances are, she’ll have a Mom Hack for that. It may be obvious, but it’s true! Too often new moms hunker down in their homes with their newborns. It’s so isolating, and the days can get loooong. Suburban and rural moms are at a greater risk for isolation. This is especially true if you give birth during the colder months — it may seem like too much of a hassle to bundle your baby (and yourself) up just to go to the store (or wherever). This was the case for me after my first arrived. She was born in late October, and when we left the hospital we hit a cold snap; the snow started falling and didn’t stop…until April! I didn’t want to go anywhere. It was cold, the streets were icy, and I was nursing round-the-clock… it was just easier to stay home. While this is probably true—it is physically easier to stay home—it’s certainly not mentally or emotionally healthy to confine yourself 24/7 to your house. Knowing this, I joined a new mom’s group through a local organization, and in addition to meeting up once a week for an hour with our babies, we were also encouraged to get together at coffee shops or restaurants. Our group leader would say, “Do your best to go, and even try to nurse in public.” This scared the sh*t out of me! I didn’t want to go anywhere, let alone pull out my milk-makers in front of others … but I did it, and slowly but surely I gained more confidence in my abilities to take my baby out by myself. Even if it’s not a formal group like mine was, some moms may find that the simple act of having something on the calendar that they need/want to do not only gets them out of the house, but helps them feel more “normal” during the postpartum period. This could be anything from scheduling a doctor’s appointment, to “scheduling” a daily or weekly walk, or an outing to a mall or coffee shop. It might even be dropping your older child off at preschool, and then heading to the market. Whatever works for you, and holds you accountable for getting out of your house and feeling like yourself again. 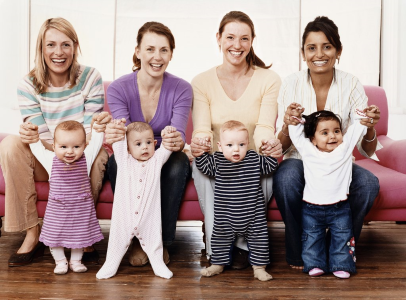 Studies have shown that moms who have stronger support from a community they’re connected to have consequently lower levels of stress and feel more optimistic about parenting in general (this could be other moms, or any network that helps make you feel supported and empowered). When you want to cry because you’re running on two hours of sleep, your baby just had her fifth blowout of the day, and your partner just called to tell you he’s going to be an hour late tonight … you can call a mom friend (who will totally get it), and she’ll help you laugh about it. What if I don’t feel like socializing? Bear in mind that not every mom loves playgroups, breastfeeding groups, new mom classes, Mom’s Night Outs, etc. That’s okay, and I totally get it. Here’s a little secret: I’m an introvert. While I love people and really enjoy spending quality time with a few close friends, I’m not a fan of being out all the time (especially with crying kids in tow) and constantly socializing in big groups. This is a case of “know thyself”: Are you an introvert, extrovert, or do you fall somewhere in between? An introvert often feels drained after long periods of socialization (yet likely enjoys and feels energized by meaningful conversations with one or two closer friends), while an extrovert feels drained after long periods of alone time, and recharges by being out with others. After I had my first child, I could not imagine going out and having to spend time with others making casual chit-chat. This sounded painful and tiresome (and I was already exhausted!). Worse, with so many people telling me I should do these things—meet other moms, get out of the house, have “girls’ nights,” etc.—I felt ashamed and guilty for not actually wanting to do these things. (“What’s wrong with me that this doesn’t sound appealing? ?”) I also felt completely overwhelmed by new motherhood and the long list of tasks it brought, so that going out with a group of moms and socializing felt like yet another overwhelming task on a seemingly unending to-do list. It took me a while, but I finally found my stride with this. 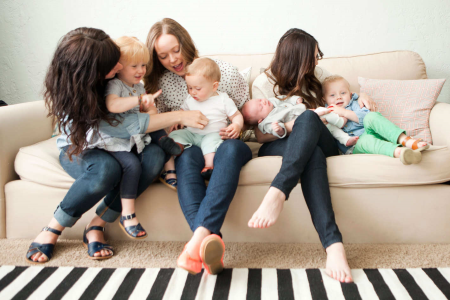 While I realized how important it was to meet other mom friends—I really did crave a network of women who understood what I was going through and who I could lean on for support—I began to understand that it wasn’t the amount of mom friends I had (or the number of times we went out together) that mattered, but rather the quality of the friendships I made. I nurtured the few close mom friends I made—the ones that I really connected with—and replaced all the other social outings with self-care hobbies, such as spending time in nature, going for walks, sipping tea in a quiet space, and writing. If this sounds like you, that’s okay! Every woman is different. The postpartum period can be tough enough; know yourself and be true to you. A “support network” means something different to everyone, so if you aren’t into the whole group thing, don’t feel pressured to do it. So now that we’ve established the importance of meeting some other women in the same boat as you (and building a “support network”—however that looks for you), how the heck are you supposed to meet these moms?! Don’t worry! From apps, to Facebook, to the neighborhood library, read ahead to get the lowdown on all the latest and greatest ways to actually connect with other moms. Very interesting topic and helpful too, for all the new moms. I like it, especially b’coz it has contained all the valuable lessons very efficiently.This is something really helpful.